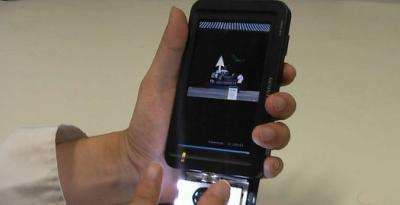 (PhysOrg.com) -- The next generation of cell phone interfaces is currently under development at Ishikawa Komuro Laboratory at the University of Tokyo but instead of using a touchscreen the new interface is touchless. 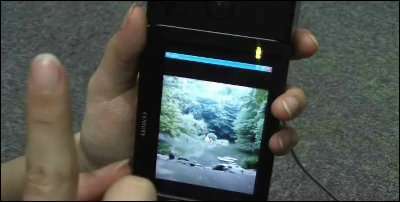 This new technology will use a high-speed camera on the cell phone to track user finger movements and gestures. The advantage to this type of interface is that movements and gestures are only limited by the camera’s field of vision. A gesture that is similar to clicking a mouse button is defined as a movement towards the camera’s optical axis. This detection uses a frequency filter that is applied to a scale change in the fingertip image. This technique would also used for typing, selecting and zooming in-and-out on images without ever touching the screen. The hardware that makes all this possible is a system which performs 3D motion tracking of human's hand and fingers from images of a single high-frame-rate camera and that recognizes typing motion in the air. 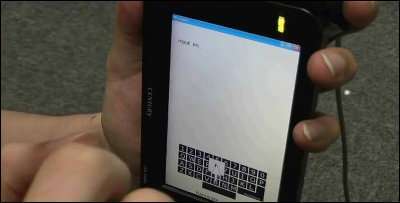 The use of a high-frame-rate camera enables recognition of rapid typing motion that would otherwise be difficult to track using standard cameras. In order for the camera to recognize real-time recognition, Ishikawa Komuro Laboratory developed hardware which parallelizes and accelerates image processing. They were able to achieve real-time recognition of typing motion with a throughput of 138 fps and a latency of 29 ms.
Ishikawa Komuro Laboratory hopes to commercialize their technology in the near future. There has been no mention of when this product will be available to consumers. Indeed. Imagine a train/bus full of people all talking commands into their phones. It could get quite noisy! Also, if two people were using the same model of phone in a small area (elevator for example), their phones might "hear" the other person's commands and inadvertently react to those commands. I think this is a better idea, although I imagine that your fingers might get tired, especially at first.